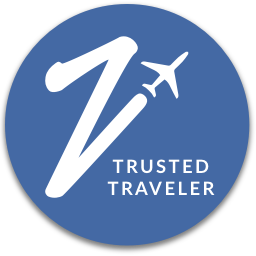 This versatile city's got you covered, for every type of traveler that your are. Earlier this year, the Huffington Post encouraged travelers to visit Mexico City over Cancun’s opalescent beaches. 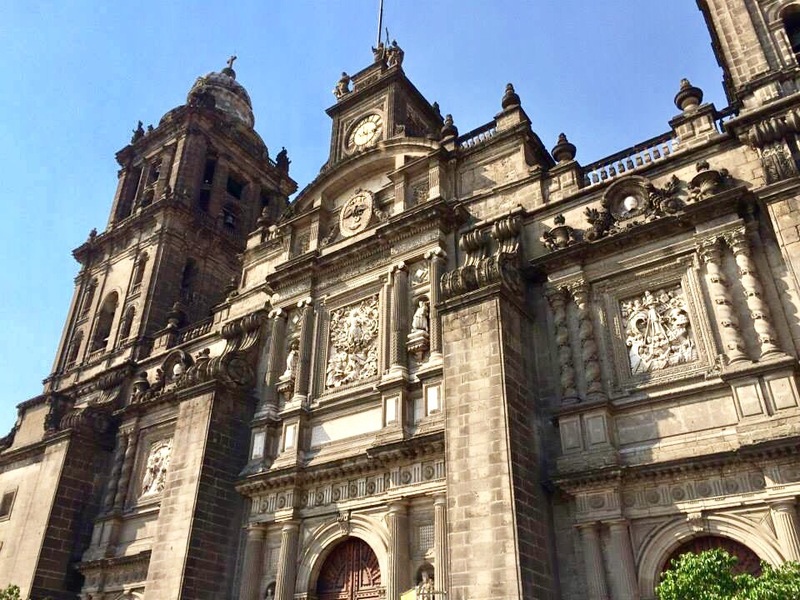 After all, Mexico City has so much more to offer by way of history, arts, food, and a bustling metropolis that plays home to one of the most prominent financial hubs in not only Latin America, but the world. 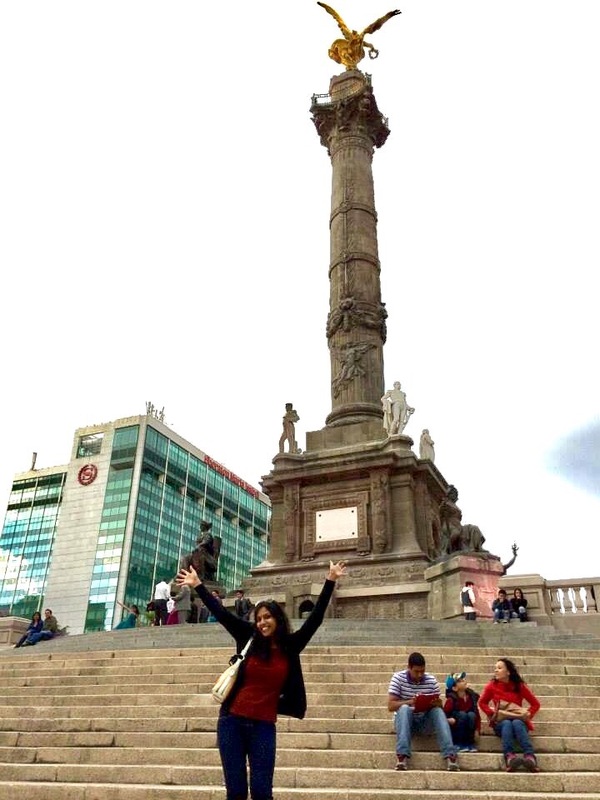 I had the opportunity to visit Mexico City when I did a one-week study program at IPADE business school at Universidad Panamericana as part of my MBA program in spring 2014. The program was set up such that we were kept busy for most of the week through classroom lectures or doing on-site company visits. At the start of the trip, I probably took the program too seriously and was focused on taking notes in preparation for the final team assignment we would have to submit by the end of the week. However, I quickly realized the key to successfully doing business in Mexico was to understand its people and culture, and part of that meant mixing business with pleasure. So I got right to it. What I discovered was a modern capital city and financial center bursting from the bubble of traditionalism, as demonstrated by its growing middle class. This section of society has becoming increasingly individualistic and ready to spend on personal goods, telecom and travel — a departure from the people’s traditionally family-centered, religious roots, and restraint in spending on basics such as food, clothing and utilities. The working class in Mexico City is thriving, and they are living life to the fullest. 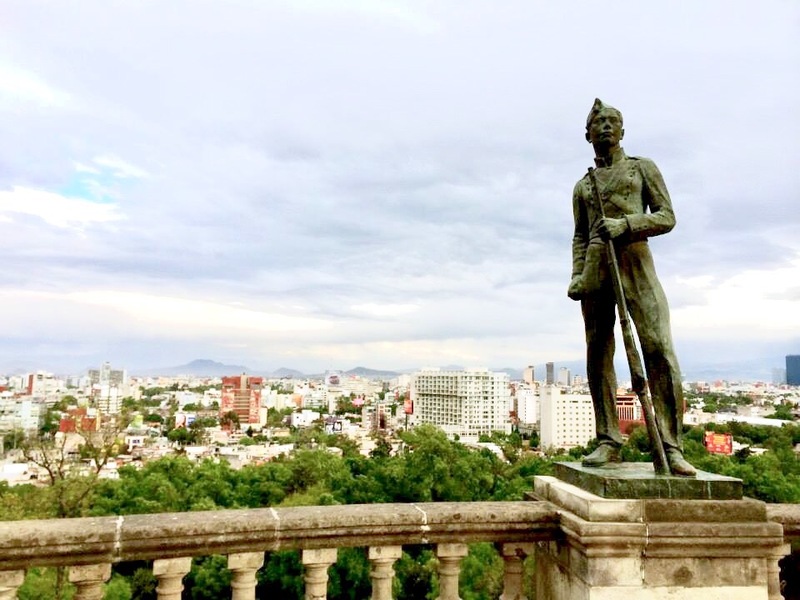 This mere glimpse into city life over just a few days was enough to show me that Mexico City abounds with interesting attractions and life, regardless of where your interests lie. Its versatility is what makes it such a family-friendly destination with allure that surpasses its coastal counterparts. On the day that I arrived in Mexico City, this was one of the first sites I visited. 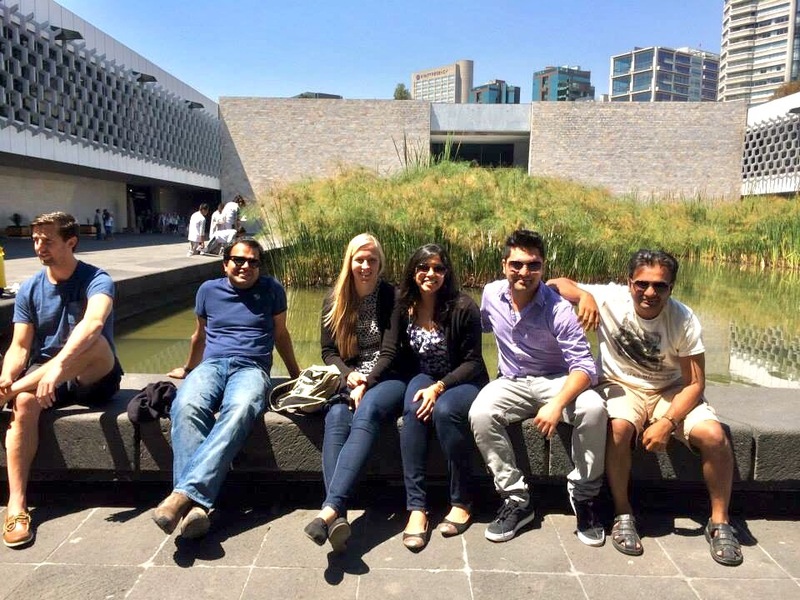 An exchange student and friend who had attended Emory the previous semester, Marilu Silva, met us at our hotel, the Hotel Marquis Reforma, and we took a cab to the Chapultepec Castle, which sits atop Chapultepec Hill, offering stunning panoramic views of the surrounding gardens and the city. The castle, which refers to “hill of the grasshopper” in the Aztec language of Nahuatl, was originally built around 1786 and has served as a military college, imperial residence, and now as the National Museum of History, housing collections of artwork and historic artifacts from the various rulers and civilizations that have called Mexico City home, according to Mexico’s tourism and culture websites. You might recognize the castle as the Capulet mansion in the 1996 film Romeo & Juliet starring Leonardo DiCaprio and Claire Danes. 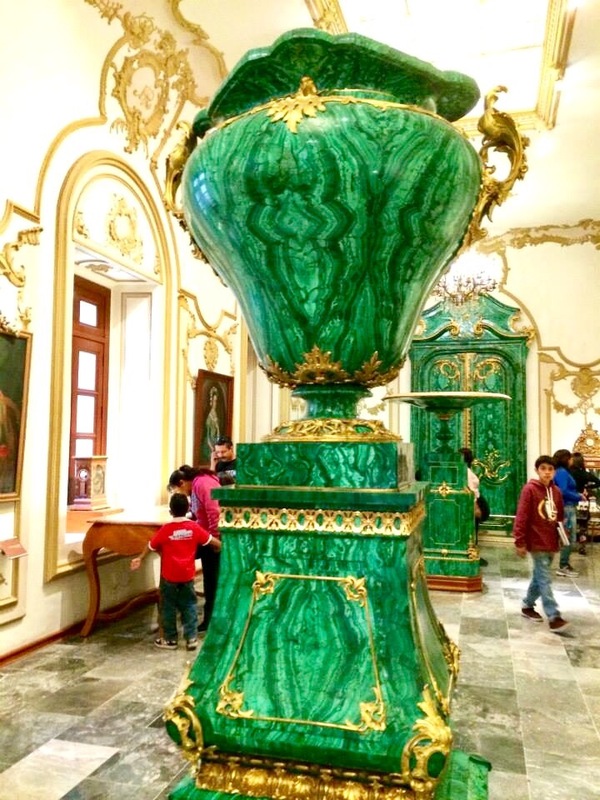 This royal abode, like so many others around the world that I’ve seen in Paris, Madrid, Vienna and Trieste, features rooms that are each splashed with linens and furnishings of a different color: for instance, the Malachite Hall in green, the royal bedrooms in blue, or the estate dining room in blush pink. It’s no wonder: the Hapsburg Emperor Maximillian and his wife Empress Charlotte, traveled from Trieste to Mexico City to reign as the country’s leaders, at the insistence of French Emperor Napoloen III, according to an October 29, 1863 report in the New York Times! 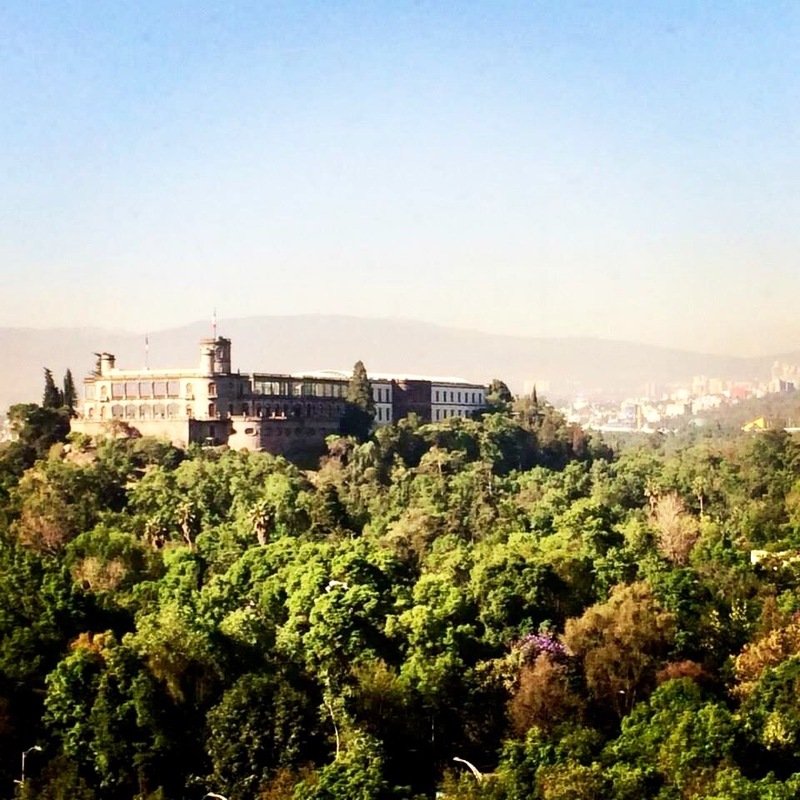 From the castle, you can stroll down into the shaded Chapultepec Park where families and couples spend leisurely afternoons. To be honest, I was susprised at how openly and passionately couples were intertwined and embracing in such a public place, but with such love and happiness radiating throughout the park, I supposed there was no such thing as TMI when it came to PDA here. 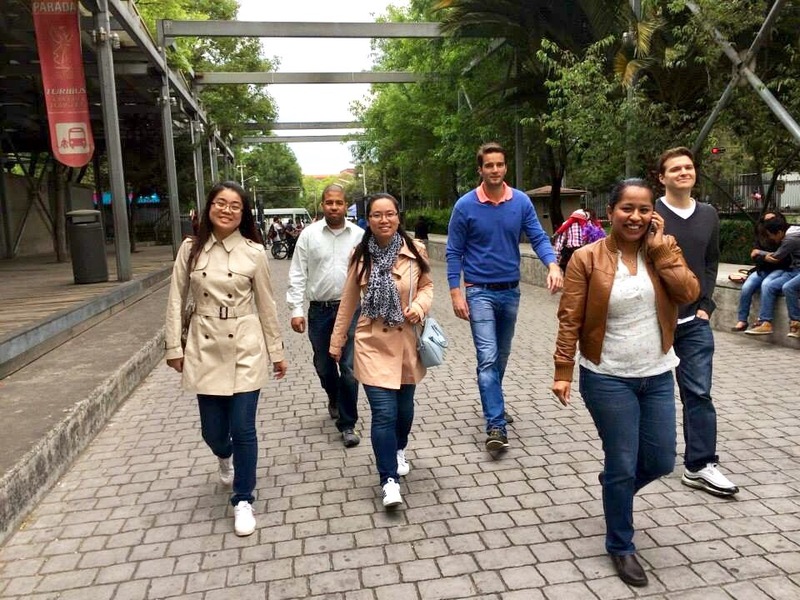 My friends and I caught up with Marilu as she told us about how Mexicans spend their weekends in the park, to unwind from the stress of a busy workweek. This was where they could just get away from it all and be themselves. From here, we walked along the Paseo de la Reforma down to the Angel of Independence statue which commemorates Mexico’s War of Independence. Along the way you’ll get a view into modern Mexico city as the wide thoroughfare is lined with opulent hotels, stores and restaurants. I personally enjoyed strolling along this avenue as it gave me a true feel for the city. It is along here that we had our first dinner in Mexico City at La Mansion on the floor level of the Marriott Reforma. Because this was a steakhouse, there were few vegetarian options for me, but I stuck with what I knew: tortilla, guacamole, and cheese. 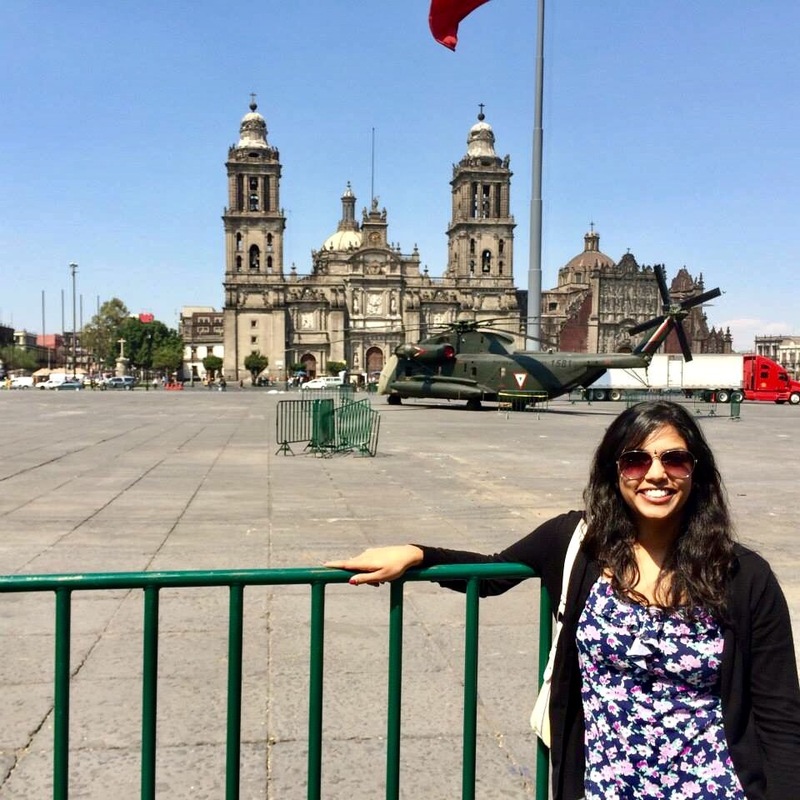 Zocalo, also known as Plaza de la Constitution, is teeming with history! This open square often hosts festivals and events, but it is bordered on one side by the National Palace and on another by the Mexico City Metropolitan Cathedral. Once the center of the Aztec city, Tenochtitlan, it later became a marketplace and finally the site of riots during the independence movement, according to the Encyclopedia of the Mexican American War. Within proximity are several other museums and historic sites such as Templo Mayor and the National Museum of Cultures. Recall the opening scene from James Bond Spectre where the Day of the Dead events take place? That’s Zocalo. This museum houses a comprehensive collection of exhibits that detail Mezoamerican history and culture and each people’s role in the development of the Americas overall. You could spend hours here learning about the civilizations that have called this region home. 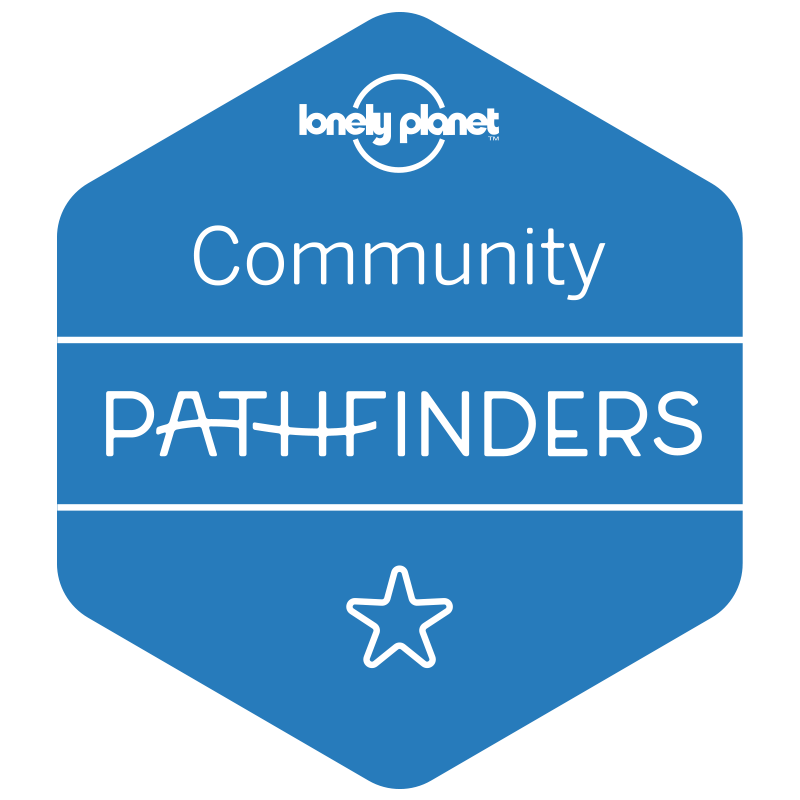 This may be a good place to start before embarking on other sightseeing adventures to provide context for all that you are about to experience throughout the rest of your stay. This one absolutely cannot be missed, no matter type of traveler you are! This is one of Mexico City’s main attractions, though it takes about an hour and a half to drive out to the site as it’s roughly 30 miles from Mexico City (and like any major city, getting out of the capital itself at certain times of the day can be a hassle due to traffic). 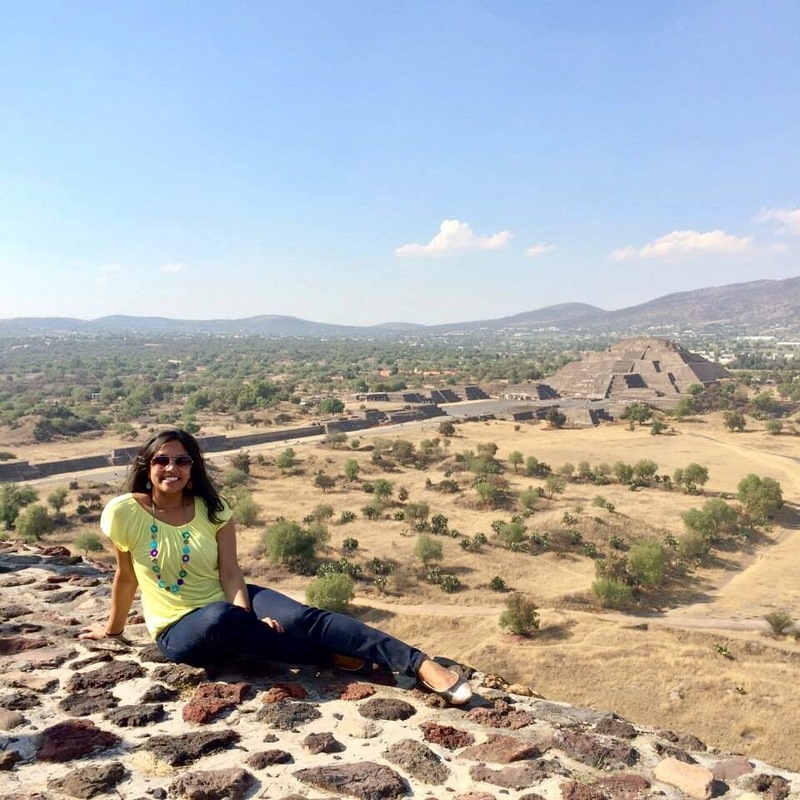 Teotihuacan are the remnants of an ancient Mayan city, once the largest of its kind in the Americas. It was built before the arrival of the Aztecs. The two main attractions here are the Pyramid of the Sun (larger) and Pyramid of the Moon (smaller). Both are impressive. These pyramids are larger than those at Chichen-Itza outside of Cancun and can be climbed, unlike Chichen-Itza. The steps were steep, and soon, I had to climb sideways up the staircase to each level. Carry an umbrella and water, because nothing will protect you from the elements here. 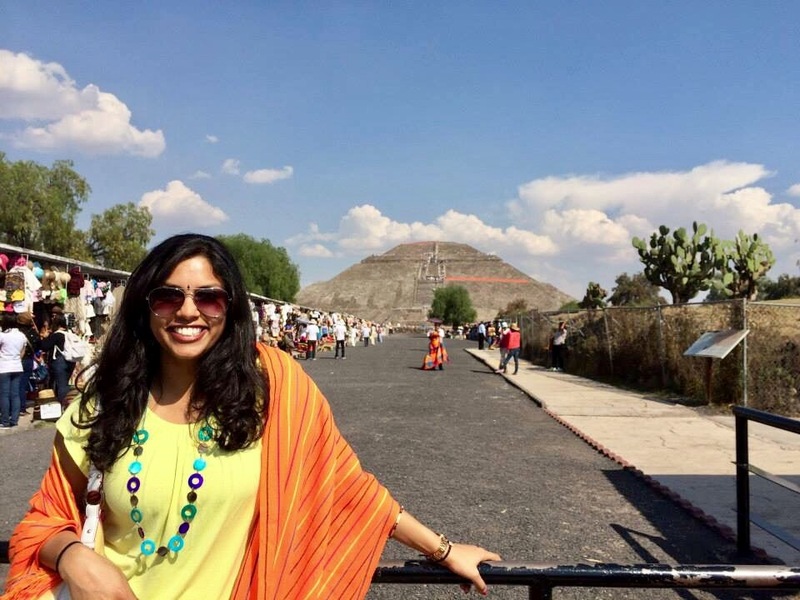 The sun beat down on us unforgivingly when we visited, so I used my newly acquired rebozo to shield me from the harsh rays. 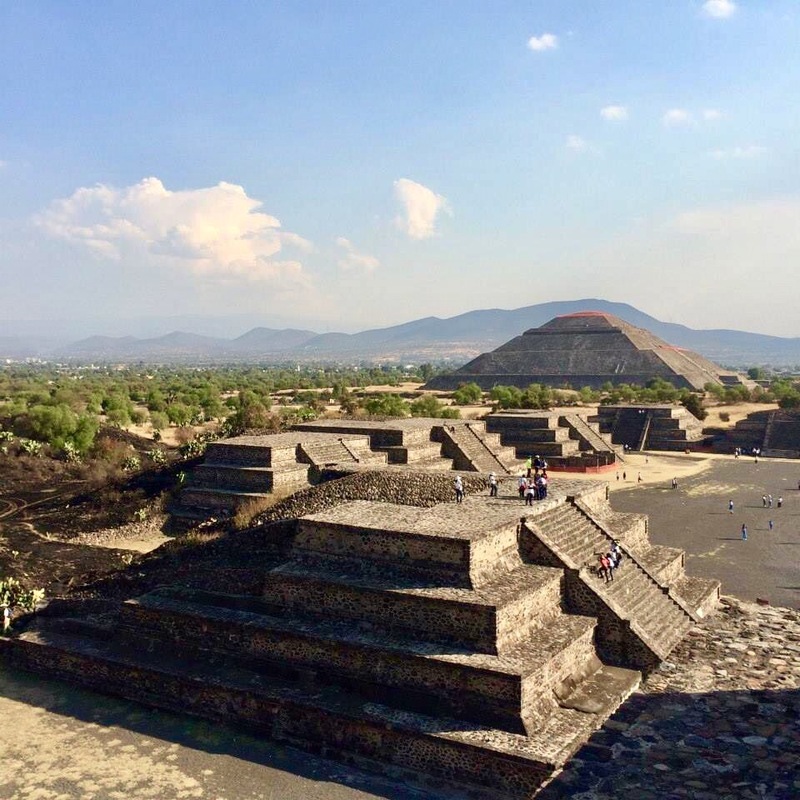 If the world-renowned pyramids at Teotihuacan are not enough to inspire awe in you, then maybe the Museo de Templo Mayor, or museum for the great temple of Tenochtitlan will do it instead. 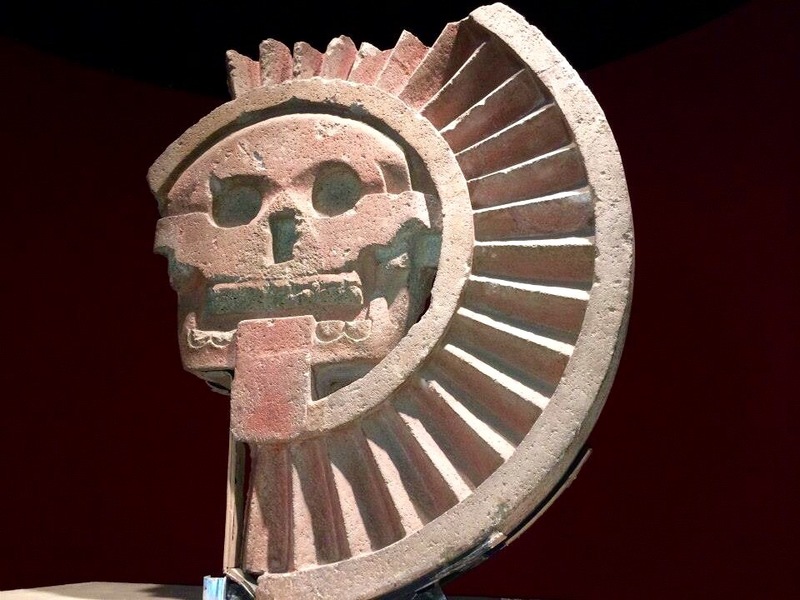 Like the Mexicans who journeyed from the island of Aztlan in the ~1200s, guided by their God of War to the lakes of the valley of Mexico, you, too, can pilgrimage to the site that was once the Aztec capital Tenochtitlan, now moden-day Mexico City, according to the museum’s website. 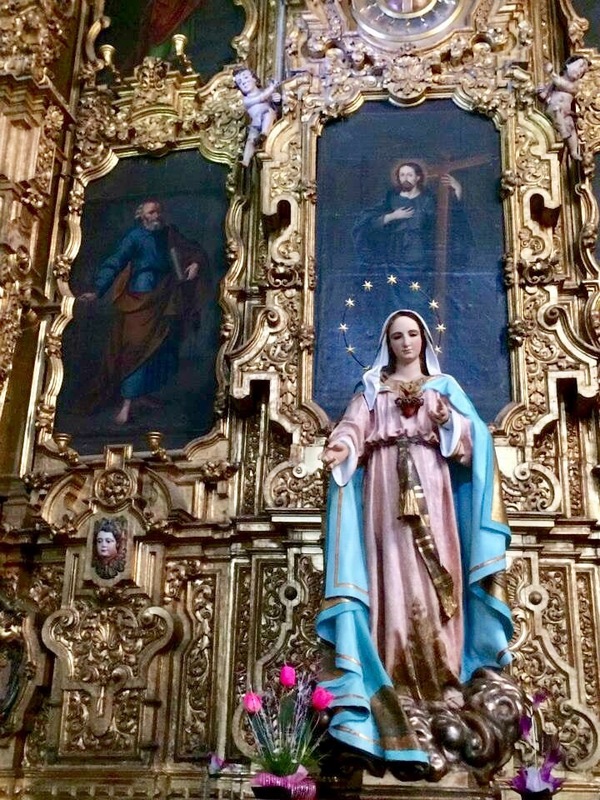 Today, there are still the remains of an archaeological site behind the Mexico City Metropolitan Cathedral, as the temple was razed to the ground during Spanish conqueror Cortes’s siege of Tenochtitlan in 1521, and a cathedral built in its place. Like the Chichen-Itza temples that have temples built one on top/inside of another, the Templo Mayor, too, followed a similar pattern since the Aztec “center of the universe” could not change place, according to the temple’s official website. We did not visit the Museo Templo Mayor but we did visit the cathedral, which is remarkable too. I was enthralled by the building’s ornate exterior carvings, only to find that the inside altars almost rivaled those I’ve seen at St. Peter’s Basilica at the Vatican. The Altar of the King and Altar of Forgiveness, gilded in gold, are particularly exquisite. One can spend a few quiet, contemplative moments in this refuge to meditate and get away from the buzz of the city. There is no scarcity of bars in this city, and mezcal is the name of the game. 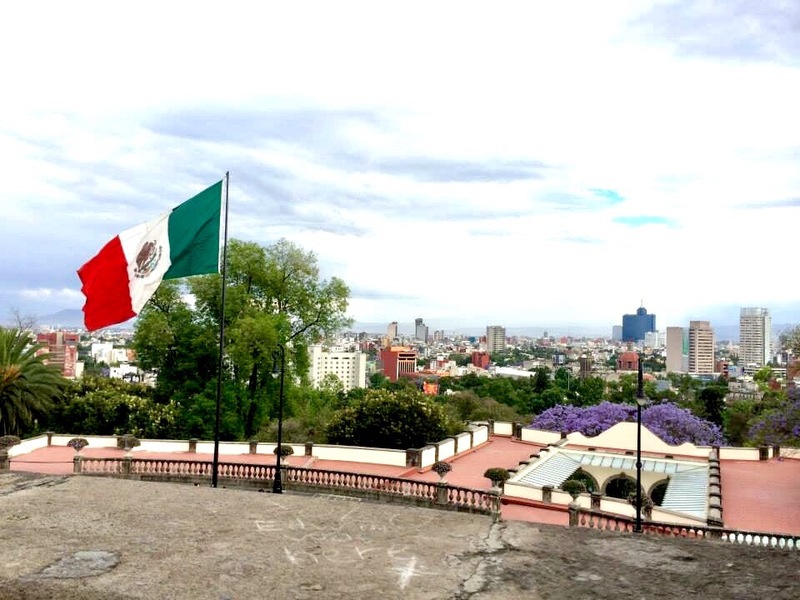 Two rooftop bars that I really enjoyed for the views were the one perched atop the Holiday Inn Zocalo Central Hotel, and La Terrazzo del Conquistador. 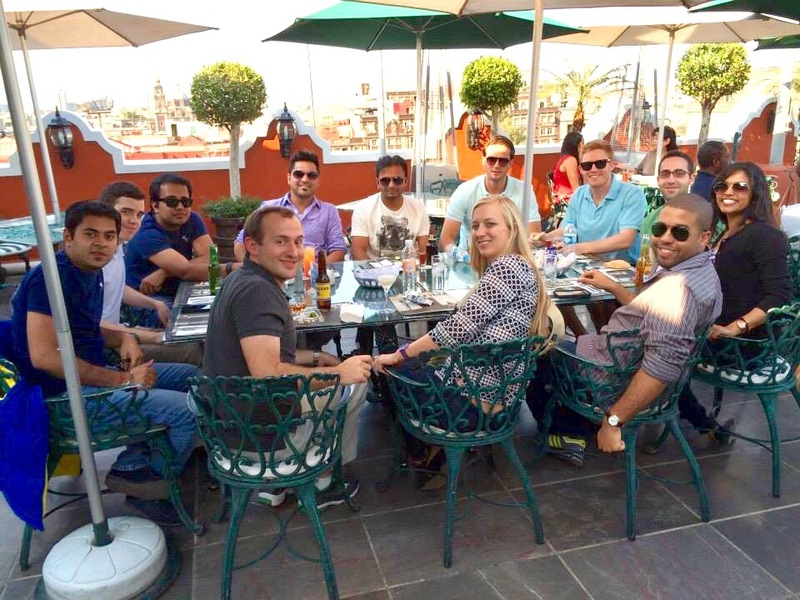 I’m not much of a drinker when I travel alone or for business purposes, but after a full day of sightseeing, all that my classmates and I wanted to do was to enjoy the beautiful Mexican cityscape at sunset, a breeze and a cool beverage. 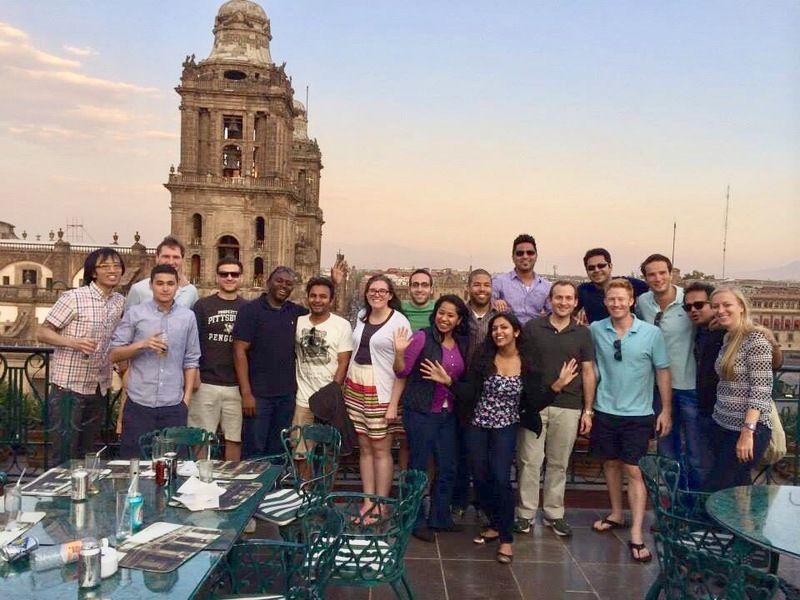 Having toured much of the Zocalo square, we went to the rooftop of the Holiday Inn Zocalo Central Hotel for stellar views of the plaza! It was a perfect place for refreshments. Laughs and stories were shared over cerveza, snacks and tequila shots, which Marilu told us was usually meant to be sipped slowly in Mexico, and not gulped down entirely at once as in America. It was after dinner that we went to the nearby La Terrazzo del Conquistador for pitchers of tangy sangria and picturesque nighttime views of the illuminated Zocalo square. 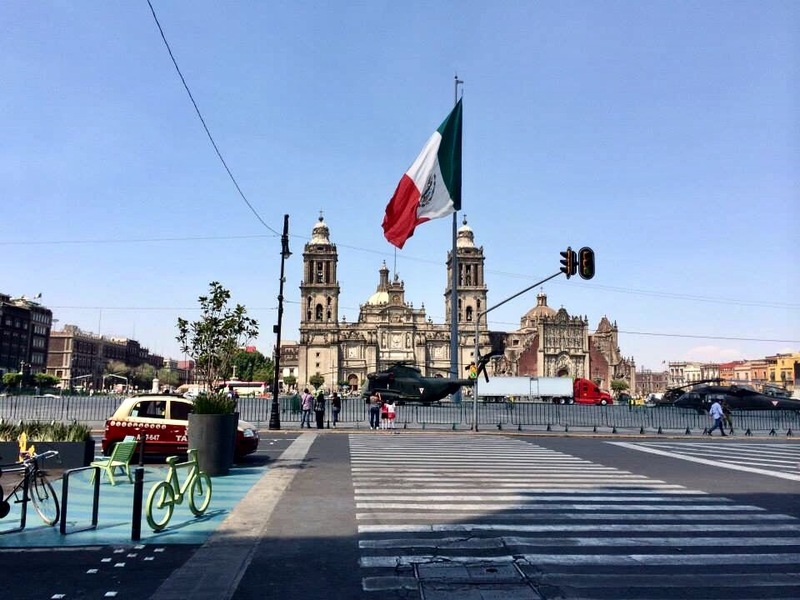 The National Palace at zocalo is already adorned with numerous pieces of artwork and murals. Of note are the murals of famous Mexican artist Diego Rivera, who has recounted much of Mexico’s history through his murals here. 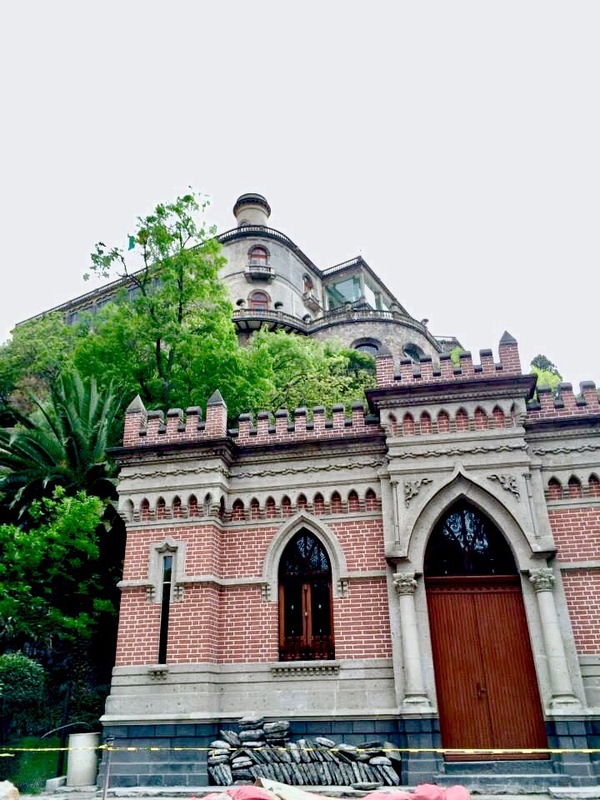 To see the works of Rivera’s wife, Frida Kahlo, a prominent artist in her now right, you can head to the the Frida Kahlo museum which is much further south in a different section of the city. If you’re more into the performing arts, you can check out event listings at the Palacio de Bellas Artes which hosts musical, dance and theater shows regularly. The lavish building alone where the spectacles take place is a visual treat itself. Close to this fine arts center is also the Museum of Popular Art which also touts kid-friendly activities. I’m not going to lie. Being a vegetarian in Mexico is tough. While there are salads and many vegetables served, the concept of “vegetarian” gets lost in translation somewhere, as I was accidentally served food that would certainly not fit the bill of meat-free. I would say, stick with the safe options: vegetables, fruit, tortilla, and cheese, if you’re not vegan or a super-strict vegetarian. I wouldn’t risk it with beans or rice as they are probably cooked in chicken broth or lard. However, one cool new ingredient I was introduced to in Mexico was the pumpkin flower. This was where we ate on our first day, as it was directly across from our hotel and had high ratings. This was my first encounter with squash flower soup, though in retrospect, I’m sure the broth was suspect. Still, I managed with chips, guac and a quesadilla. 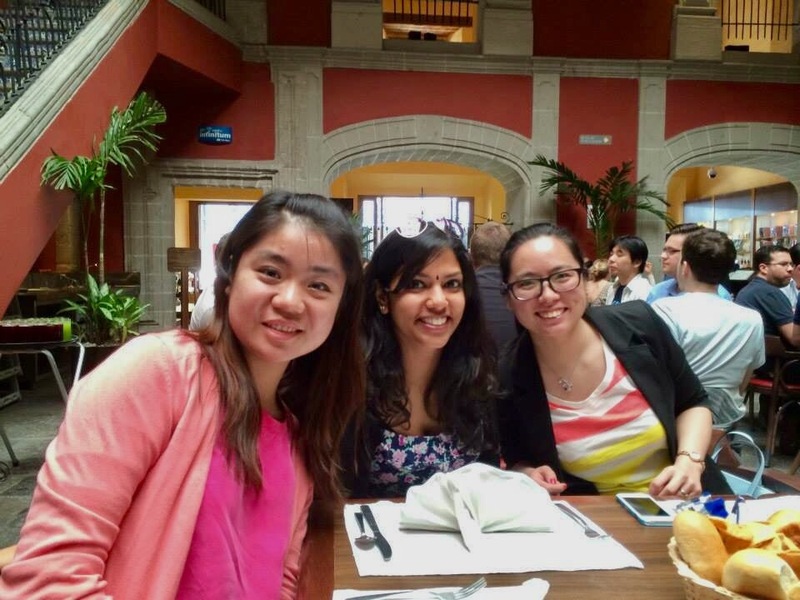 On the same day we toured the historic city center, our IPADE hosts took us to the Sanborns restaurant at the Casa de los Azulejos or “House of Tiles.” They wanted to give us a traditional Mexican dining experience. Located a walkable distance from Zocalo, this building was once a palace. The atmosphere of this restaurant is impressive and reminded me of the Columbia restaurant in Ybor City in downtown Tampa. We were seated in the courtyard and served course upon course of traditional Mexican fare. 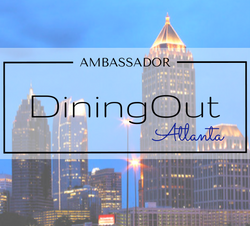 It’s too bad I couldn’t try or report on more of the cuisine, but that didn’t take away from the five other ways I was able to enjoy this multifaceted city. So what are you waiting for? The Mexican capital is calling.